Born on 27th Semptember 1651, Sophia Alekseyevna was the daughter of Tsar Alexei I and his first wife Maria Miloslavskaya. Because of her rank, she was destined to lead a very solitary and confined existence: she couldn't even leave her luxurious inner quarters at court unless she was shilded by a curtain of red silk so that no one could see and hear her, and should she decide to marry, she couldn't choose anyone below her rank. But Sophia was no ordinary woman. She was clever, brilliant, well-educated and ambitious and she would eventually become the first woman to rule the Russian Empire. Sophia had a very active mind and convinced her father to allow her to share lessons with her sick brother Fyodor, heir to the Russian throne. The Tsar also had two other sons, Ivan, who was an invalid and blind, and Peter, the son he had from his second wife Nataliya Kyrillovna Naryshkina. However, their education was neglected because their chances of becoming Tsar were considered very remote. As she grew older, Sophia began to attend council meetings, and even shared her ideas and advice on state matters . Here, she also met the boyards, members of the Russian nobility that influenced Russian policy. In 1676, her father died. Her sick brother became Tsar Fyodor III and Sophia her chief advisor and confidante. However, Fyodor didn't occupy the throne for long. He died in 1682, aged only 20. Her step-brother Peter, who was only 10 at the time, was declared tsar over Ivan, who wasn't deemed fit to rule because of his infirmities. This didn't go down well with Sophia, who didn't want the Naryshkina family to gain power and rumours were spread that they had poisoned Fyodor so they could rule through Peter. The army rose in support of Ivan, claiming that despite his infirmities, he was the rightful heir to the throne. To solve the matter, Sophia suggested she would rule as regent on behalf of both Ivan and Peter, until they were old enough to rule. Although the court didn't like the idea of having two tzars, the need to stop the violence of the army prevailed and Sophia's plan agreed upon. 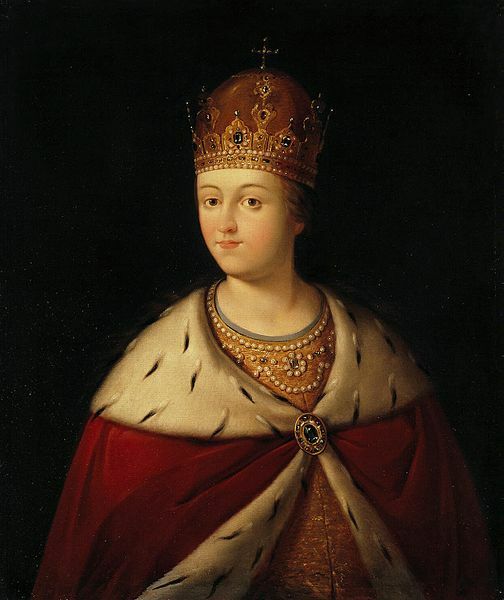 Sophia Alekseyevna had became the first ruler of the Russian Empire. And rule she did, and well. She preferred treaties to bloodshed and signed the Eternal Peace Treaty of 1686 with Poland, and a trade agreement with Imperial China, the first "western" country to do so. 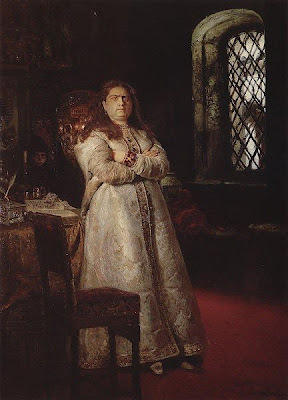 She tried to reorganize the army, created the Slavonic-Greek-Latin Academy, the first Russian higher learning institution and had coins minted in her name. But if she hoped to reign until her death, she was very much mistaken. Peter was growing up and soon he wouldn't need a regent anymore. In 1689, he turned 17 and his releatives asked Sophia to step down. In the meantime Peter, who didn't trust his step-sister, fled to a fortified monastery near Moscow. Sophia summoned him, but he refused to go to her. Instead, more and more of the army officials abandoned her to serve Peter. Power was slipping through her hands and soon, she had no choice but to renounce the throne. Peter had her arrested and confined her to a convent, but she didn't take the veil just yet. Sophia still had her supporters and ten years later, when Peter was out of the country, they tried to reinstate her to the throne, but failed. It is unlikley that she had anything to do with this attempt though, but still the rebels' corpses were suspended outside her windows, as a warning. She now decided to take the veil and spent the rest of her life in solitary confinement. She died six years later, on 14th July 1704.